FILE - OxyContin pills are arranged at a pharmacy in Montpelier, Vermont, Feb. 19, 2013. Companies selling some of the most lucrative prescription painkillers funneled millions of dollars to advocacy groups that in turn promoted the medications' use, according to a report released Monday by a U.S. senator. The investigation by Missouri's Senator Claire McCaskill sheds light on the opioid industry's ability to shape public opinion and raises questions about its role in an overdose epidemic that has claimed hundreds of thousands of American lives. Representatives of some of the drugmakers named in the report said they did not set conditions on how the money was to be spent or force the groups to advocate for their painkillers. The report from McCaskill, ranking Democrat on the Senate's homeland security committee, examines advocacy funding by the makers of the top five opioid painkillers by worldwide sales in 2015. Financial information the companies provided to Senate staff shows they spent more than $10 million between 2012 and 2017 to support 14 advocacy groups and affiliated doctors. FILE - Senate Homeland Security and Governmental Affairs Committee ranking member Sen. Claire McCaskill, D-Mo., asks a question during a hearing on Capitol Hill in Washington, June 6, 2017. "It looks pretty damning when these groups were pushing the message about how wonderful opioids are and they were being heavily funded, in the millions of dollars, by the manufacturers of those drugs," said Lewis Nelson, a Rutgers University doctor and opioid expert. 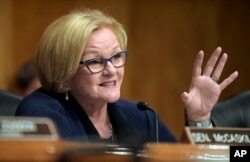 McCaskill's staff asked drugmakers to turn over records of payments they made to groups and affiliated physicians, part of a broader investigation by the senator into the opioid crisis. The request was sent last year to five companies: Purdue Pharma; Insys Therapeutics; Janssen Pharmaceuticals, owned by Johnson & Johnson; Mylan; and Depomed. "Doctors and the public have no way of knowing the true source of this information and that's why we have to take steps to provide transparency," said McCaskill in an interview with The Associated Press. The senator plans to introduce legislation requiring increased disclosure about the financial relationships between drugmakers and certain advocacy groups. "We really don't take direction from them about what we advocate for," Twillman said of the industry. The tactics highlighted in Monday's report are at the heart of lawsuits filed by hundreds of state and local governments against the opioid industry. The suits allege that drugmakers misled doctors and patients about the risks of opioids by enlisting "front groups" and "key opinion leaders" who oversold the drugs' benefits and encouraged overprescribing. In the legal claims, the governments seek money and changes to how the industry operates, including an end to the use of outside groups to push their drugs. FILE - Different brands and dosages of fentanyl patches are seen, April 26, 2006. Although initially driven by prescription drugs, most opioid deaths now involve illicit drugs, including heroin and fentanyl. In a statement, the company did not address whether it was trying to influence the positions of the groups it supported, but said it does help organizations "that are interested in helping patients receive appropriate care." 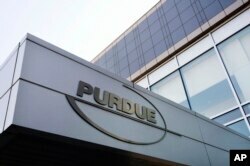 On Friday, Purdue announced it would no longer market OxyContin to doctors. Insys Therapeutics, a company recently targeted by federal prosecutors, provided more than $3.5 million to interest groups and physicians, according to McCaskill's report. Last year, the company's founder was indicted for allegedly offering bribes to doctors to write prescriptions for the company's spray-based fentanyl medication. "The question was: Do we make these people suffer, or do we work with this company that has a terrible name?" said U.S. Pain founder Paul Gileno, explaining why his organization sought the money.